As legend has it, in the summer of 1950, young water enthusiast and woodshop fanatic Hobart “Hobie” Alter began shaping nine-foot balsawood surfboards for his friends in the Alter family garage in Laguna Beach. Initially a hobby, the fine craftsmanship and passion which Hobie put into his work created a product that was beautiful to behold, durable and popular. 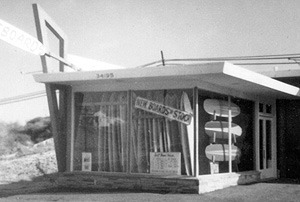 Soon surfers of all ages were clamoring for Hobie’s longboards, and to meet the demand Alter opened up a surf shop in Dana Point in 1954, reportedly the first of its kind in Southern California. Four years later Alter and his friend Gordon “Grubby” Clark (of Clark Foam fame) teamed to create the first surfboards made from foam and fiberglass. The new boards were said to be lighter, faster and more responsive than anything previously available. The product soon took off. Then the decade of the ‘60s saw Alter introduce lightweight, fast catamarans in sizes ranging from 14’ to 60’. In the years to come, the innovator would add gliders, bodyboards, snowboards, wakeboards, water skis, kayaks, skateboards, sportswear and assorted accessories to his arsenal. 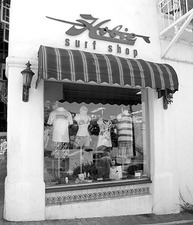 The continued popularity of the Hobie line would eventually lead to the opening of retail stores in Laguna Beach, Dana Point and Ladera Ranch. 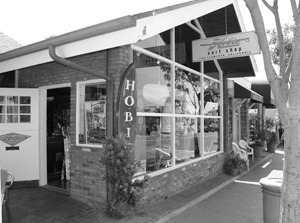 In July, 2007, Hobie Surf Shops opened two stores in downtown San Clemente. One, the larger of the pair, is housed in the former longtime site of Rocky’s Sportswear, in the Bartlett Building on the corner of El Camino Real and Del Mar. The other is on Del Mar in the ex-World Core retail site. Rickerl, a Dana Point native, started working in the Dana Point store in 1997 while still in high school. She stayed with the company after her graduation, eventually becoming the manager of the Laguna Beach store, which she ran for eight years. “When I heard that we were going to open (in San Clemente), I asked to be transferred here,” says Rickerl, who lives in San Clemente. “San Clemente is so beautiful and our customers have been wonderful.” She added that the larger of the two stores houses all the “soft goods,” the fashion side of the business, while the store on Del Mar carries surfboards and surf-related accessories, “the ‘function’ arm of the business,” as she called it. Among the articles of clothing found in a typical Hobie Surf Shop’ store are shorts, tank tops, T-shirts, sweatshirts, hoodies and casual shoes, among many other items. All of the stores stock clothes for men, women and children. Swimsuits and bikinis are also plentiful in many styles and in various sizes. Fitting rooms are available. Rickerl said that business has been steady at both locations, even with the current economic slowdown. “We have seen a lot of tourists from overseas come into the stores,” she said, a sign she attributes to the decline in the buying power of the U.S. dollar. “I think a lot more Americans are going to vacation within the United States this year (because of the weak dollar),” she added. More than a half-century from when Hobie Alter shaped his first balsawood longboard, the line of surfboards that bears his name are still shaped by hand in a company-owned facility in Capistrano Beach. Not only that, but the stores pride themselves on their many “green” products and their alliance with Patagonia. Rickerl, who calls her job “lots of fun,” said that one of the things that she likes best about working for Hobie Surf Shops is the interaction between employees and customers.